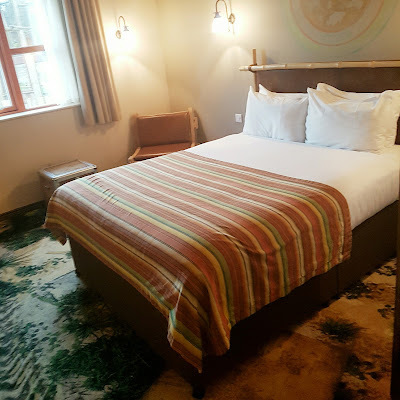 Recently D and I accepted an exciting invitation to not only experience the brand new Buffalo River Ride Adventure before it opened it doors to the public, but to also spend the night in the Azteca Hotel. 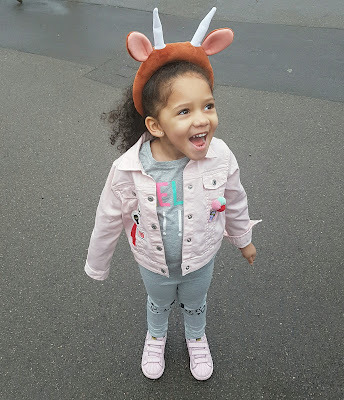 We travelled to Chessington World of Adventures by public transport. From central London it is only a short 35minutes train ride away. 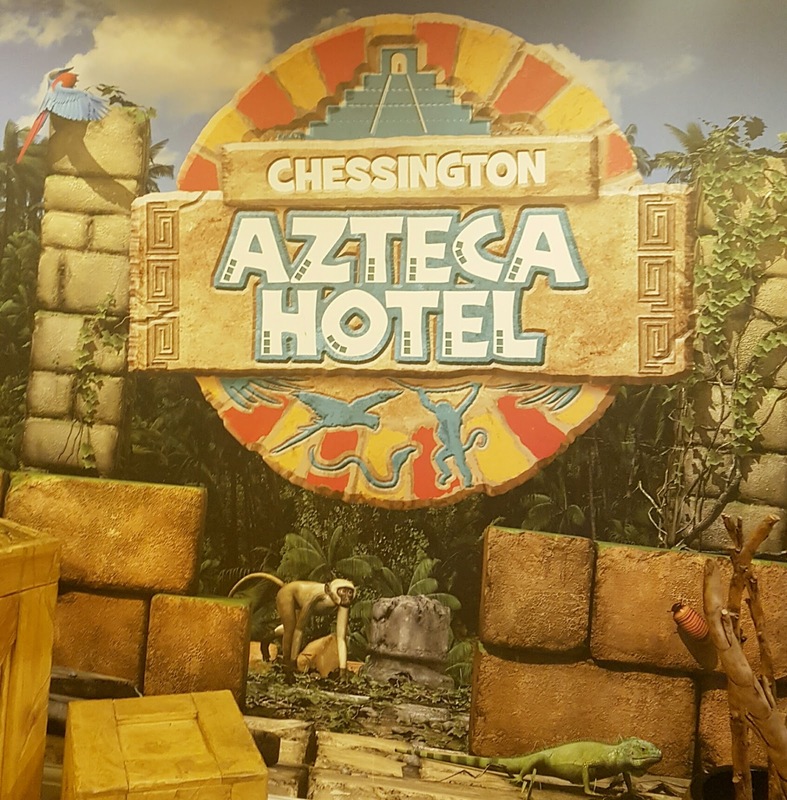 Once you arrive at Chessington South, it's a 10 - 15 minute walk, you can also get a taxi or do what we did and got the 71 bus which stops right outside the park. I have to say we were really impressed with the theme of the hotel. 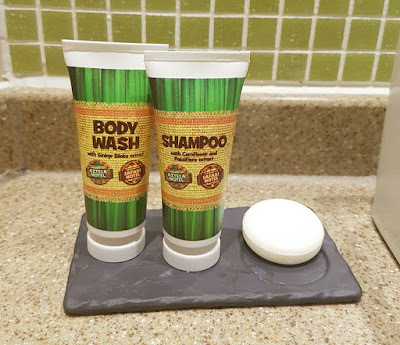 As soon as you step foot in the hotel you are transported into a different world. 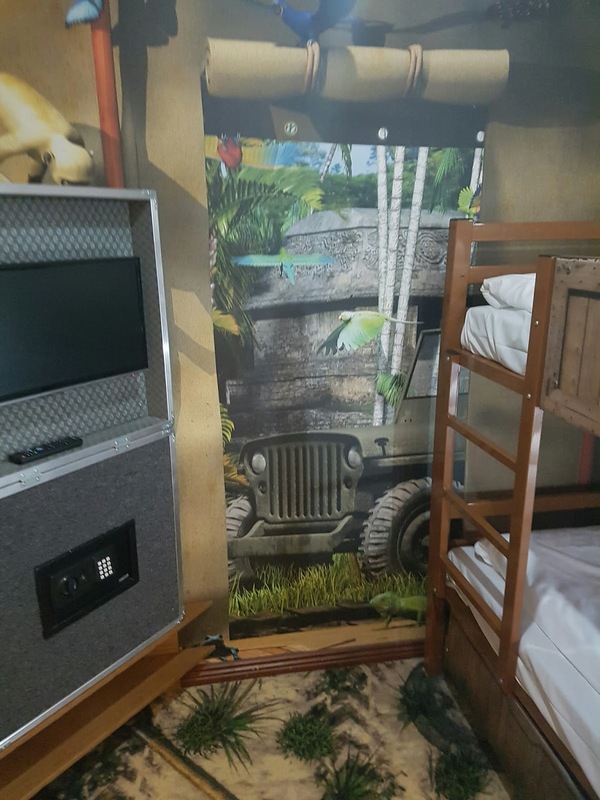 As you walk into the room you are met by the first of two areas. The childrens area has a bunk bed and a pull out and their own TV which also had interactive games on and a safe for their treasures. The second area hosts a double bed and a TV, all rooms also have complimentary WI FI, which was rather fast compared to some hotels that I have stayed in. The bathroom is also a good size and had not one but two shower heads with amazing water pressure, plenty of towels and some toiletries. 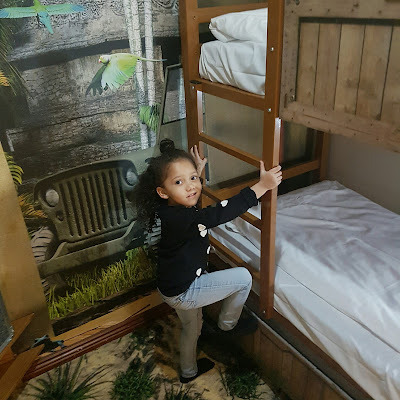 The room sleeps up to 5 people (2 adults, 3 children) and there is plenty of space for everyone. 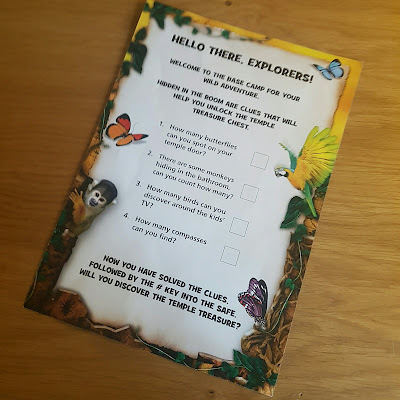 Before heading down for the evenings we par took in a treasure hunt in our room, thanks to the activity card which was left for us. 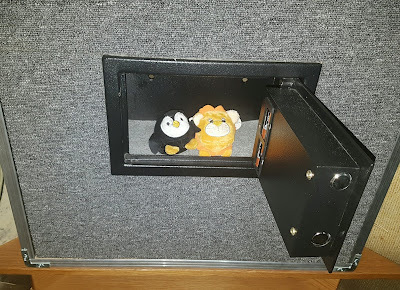 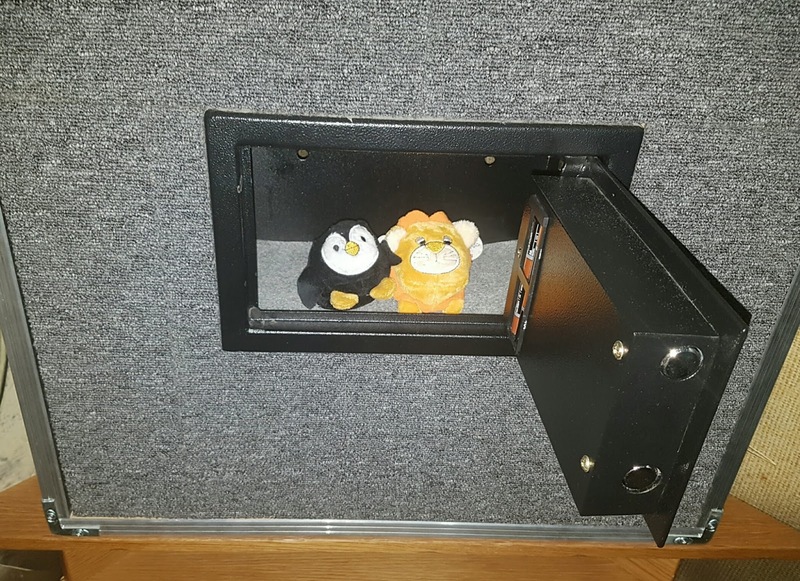 Once we cracked the code we opened the safe to find our reward. We had a yummy dinner at the Steakhouse BBQ restaurant, which is located in the park itself. 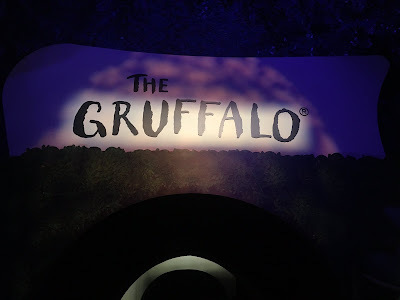 The brisket was to die for and there was a great childrens menu. 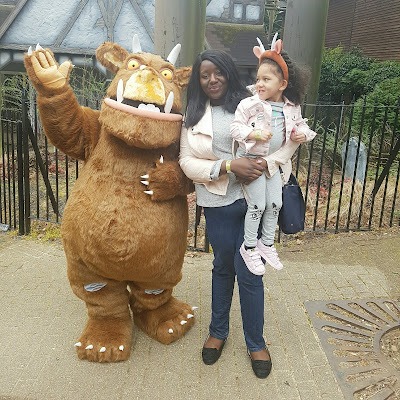 We listenedd to a live band, a magican was mesmerising people with his tricks, lots of arts and craft for the children and The Gruffalo was playing on a big screen. 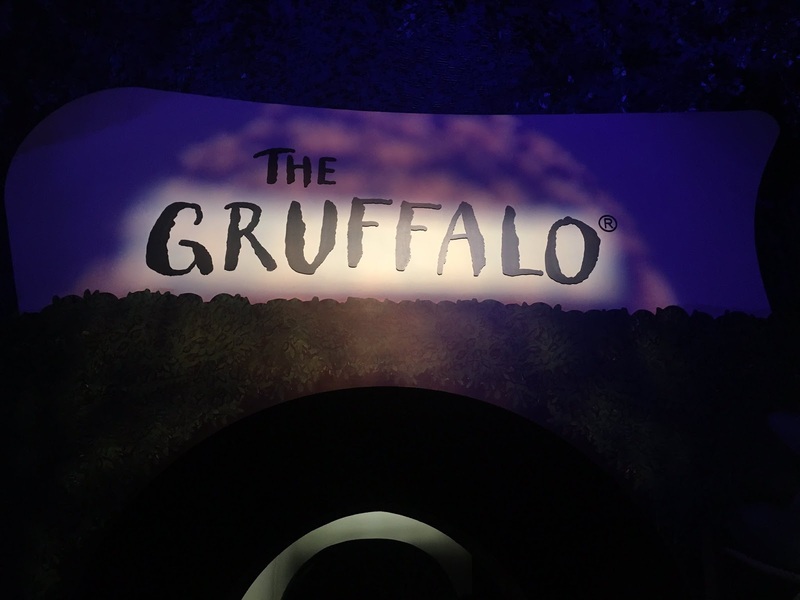 After our bellies were full of Gruffalo theme food and drinks, we headed back up to our room for a bedtime story. 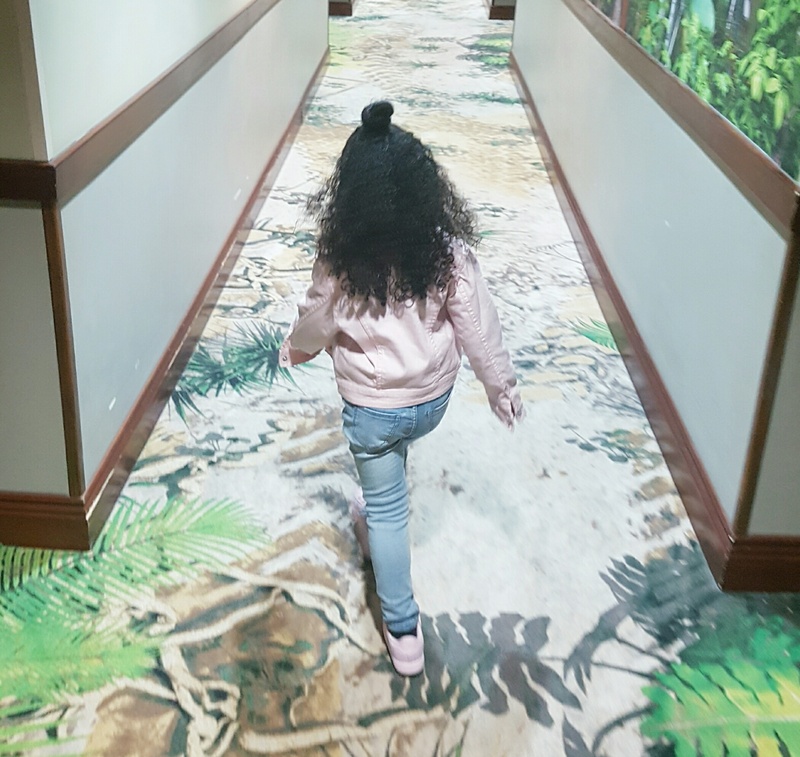 Breakfast was a pleasant experience, with a variety of foods including a hot buffet and a smoothie bar which setted us up for the day. We then headed off to the park to experience the ride. The Gruffalo River Ride Adventures takes you through the book. 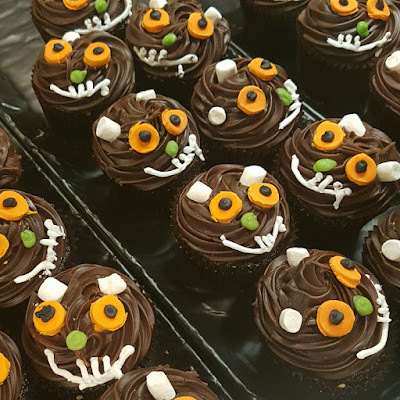 From the mouse meeting the Fox, Owl and Snake and then of course the Gruffalo. 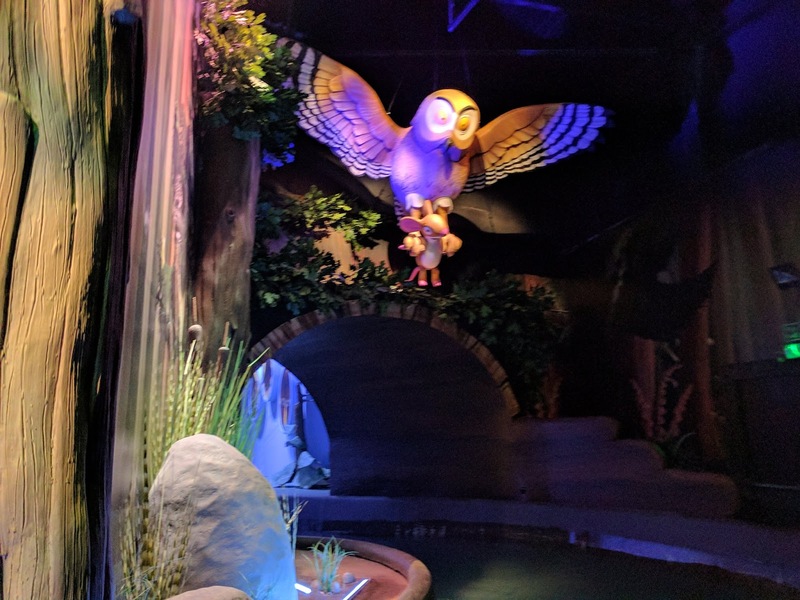 I don't want to spoil the experience for you but expect a sensory experiences with smoke effects, smells and of course water!!. 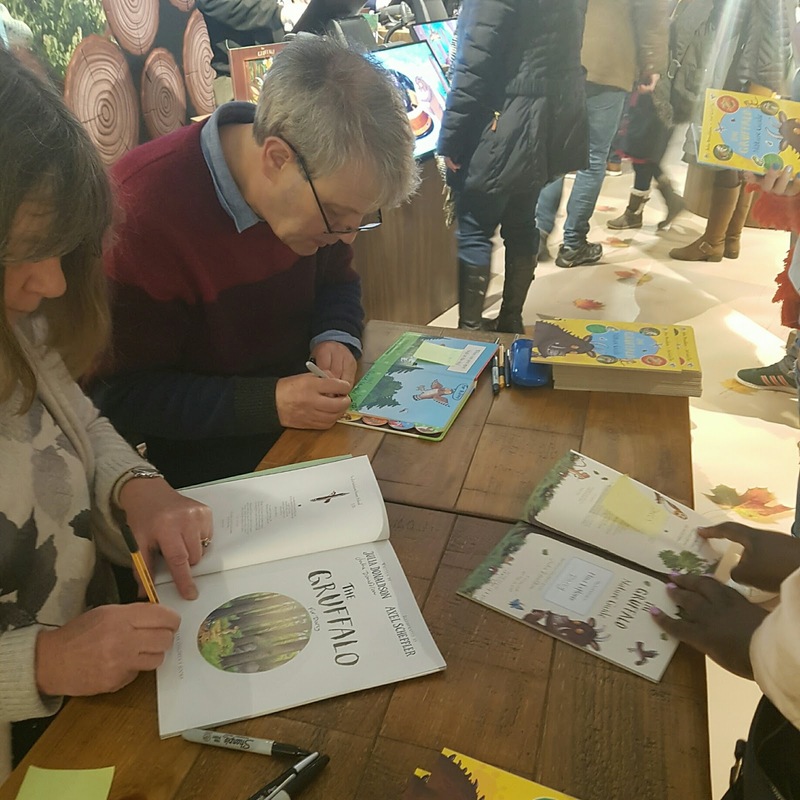 After the ride there was an extra special treat, we lucky to get our books signed by the authorJulia Donaldson and illustrator Axel Scheffler who also took time to draw a little illustration in every child's book. 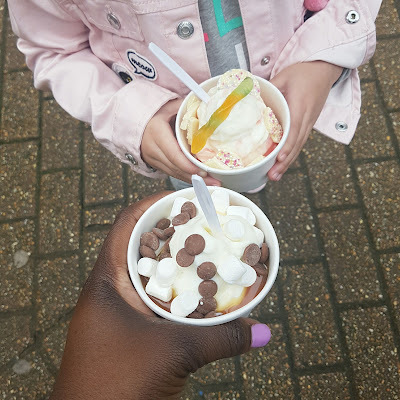 It was then time for some frozen yoghurt, from the new Gruffalo Bite stall which is located right next to the ride and has Gruffalo themed flavours. D opted for scrambled snake and I had roasted fox. We spent some time exploring the park, which also has Sea Life Centre and a Zoo with over 1000 animals including tigers, lions and giraffes before heading home. We had a lovely, stress free time at Chessington and will be visiting again very soon. 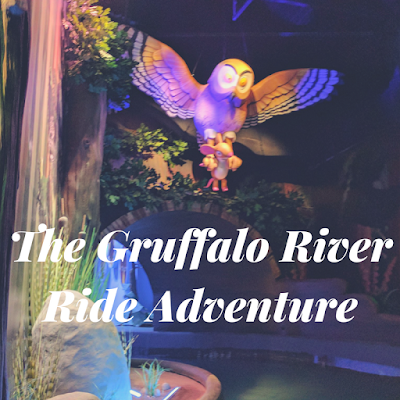 * we were invited to the launch of the new Gruffalo River Ride Adventures for free however all views are my own.